“Everywhere I go I’m asked if I think the university stifles writers. Note: The opinions expressed by the Writer are his own, and may not necessarily reflect those of the Fire Technicians Network, its affiliates, sponsors, members and/or Directors. Vancouver, British Columbia - Many Canadians spent a good portion of last year celebrating the signing of the British North America Act (which declared Canada a Sovereign State), as well as in acknowledging some incredible individuals that have made meaningful (and notable) contributions to the fabric of our society. Last year took some decidedly dark turns as well. Seventy-one innocent lives were lost in one of the worst high-rise fires we’ve seen, and which state-of-the-art communications technology ensured we were all able to watch first hand. When, on May 6th, 1937, Herbert Morrison was providing commentary on the Hindenburg’s arrival at the Lakehurst Naval Air Station in New Jersey, after the airship’s historic and successful inaugural flight across the Atlantic, he described the sudden explosion of fire and the subsequent crash to, what was then, a largely radio audience. His comments weren’t even broadcast live. They were actually recorded on a record disk and flown to the WLS radio station in Chicago (an NBC affiliate) for broadcast that evening. Technology has provided us with many amazing benefits. I work with a variety of them every day. Smart phones, digital multi-meters, cloud storage, compact notebooks, tablets... heck even my car incorporates some really amazing interactive technology (and I don’t drive the “deluxe” edition). Yet it is the ability for us to have a FRONT ROW SEAT in a disaster like the Grenfell Towers fire that really brings home how technology has enabled our society to share both our brightest, and our darkest moments. And all in the wink of an eye, in high definition, slow motion video. Witnesses interviewed, live, while firefighters valiantly battled the flames, described children being flung from fifteen storey windows by their parents in a frantic and futile final effort to save them. It was beyond unimaginable. And worse, Grenfell Towers is not the first high-rise building in which combustible cladding figures prominently in the rapid spread of a fire across multiple floors (and separated fire compartments). It’s also not the only building in our modern world without fire sprinklers or a fire alarm system installed. That’s an interesting and perplexing question! Someone once told me that the Building and Fire Codes are written from the lessons we’ve learned from past experiences. Or, to put it more bluntly, in the blood of innocent victims. How can we ensure that good Engineering practice becomes that all-important part of our new safety mantra in design and construction? For starters, a more thorough risk analysis is going to be required for today’s LEED Certified buildings, where construction methods, materials and design incorporate some radical new technologies, compounds, and components. The videos and images of high-rise fires from around the world are proof that energy efficiencies don’t always provide the level of life safety we strive to achieve through the process of Code and Standards development. LEED certified buildings are more expensive to construct, but cheaper to operate over the long term. But when did energy savings trump fire safety. And should it? Shouldn’t good Engineering practice be benefiting both? Along with a host of other deficiencies and violations that were identified in buildings across Britain in the wake of the Grenfell Towers disaster, two clear and troubling issues have emerged that involve the substandard testing of building life safety equipment and systems by supposedly qualified individuals, and the collusion between some testing agencies and building owners to cover-up certain deficient findings. 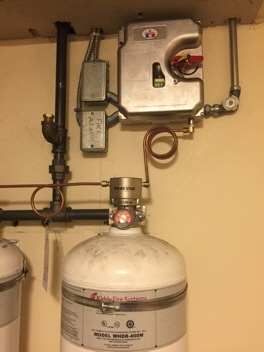 In Canada, I’m frequently awed at the lack of understanding that technicians have for the Standards which govern the installation, testing, inspection, and servicing of building life safety systems. It’s even more frustrating for me to see Building Officials and Registered Professionals deliberately hoodwinked by individuals that are considered qualified to perform these critically important services. Take a few moments to read our May, 2017 and October, 2016 Editorials before you dive into Ms. Beverly Romeo-Beehler’s, the City of Toronto’s Auditor General, Report on the Fraudulent Inspection and Testing Services performed on a number of the city’s iconic buildings. If we take away one lesson from the Grenfell Towers disaster, let it be that we cannot cut corners or ignore key inspection findings to the detriment of the people living (or working) in a building. Life safety shouldn’t be sacrificed to any pretext that involves saving a building owner money. As technicians, we are at the front line. We are often provided access to areas of a building that the local fire department’s Fire Prevention Branch hardly ever sees (unless they’re responding to an actual emergency, investigating a complaint or a fire event). We are eyes and ears and voices, and it’s time we all started using these three simple basic tools. 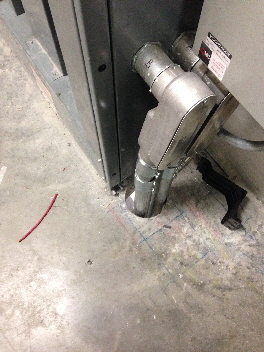 Post-development installation of power conditioning equipment in this electrical service room lacked the proper fire-stopping between the floors of the building. When the ceiling height was adjusted to allow the installation of some additional air handling duct work (in 2005), the sprinkler system somehow got overlooked (in every annual report until 2015). When does a Badger control head make a Kidde kitchen suppression system compliant? Did the fire doors on each floor operate properly? Whenever I ask this of the RFPTs (Registered Fire Protection Technicians) I encounter in my travels in B.C.’s Lower Mainland, the response I get follows pretty much a standard script: that they’re on site to inspect an extinguisher (EX), emergency lighting (EL), or fire alarm system (AL) and that they’re not required to test fire doors (or comment on their operation). Where is this statement found? In the ASTTBC Practice Guildeline (2008). More specifically in Section 9. Provision of Services. I’ve recently observed that the CFAA has been implementing some changes that go beyond the educational criteria they’d established a little over a year ago for the technicians they certify (I’m no longer a member so have to rely on information people send me). Now, I recognize that what follows is going to be viewed as a bit confrontational. It is not my intent to question the integrity or passion of the many individuals who have selflessly volunteered their time, expertise, and knowledge in trying to promote the use of fire alarm systems in Canada. I happen to engage with many of them during Working Group meetings in the development of ULC Standards, and they all have my deep and abiding respect. But we are at critical cross-roads in Canada. The INDUSTRY has to change the way it trains and certifies technicians. CFAA’s educational efforts do not address this. Their certification model does not address this. Their recently introduced new complaints process won’t address this. Let’s take a look under the hood, so to speak. First off, complaints are often difficult to deal with, particularly when they could involve a whole host of legal technicalities, complex equipment and interactions (more-often-than-not, undocumented), regulations, Codes, Standards and people. Technician malpractice can (and frequently does) include deliberate omissions that could be serious enough to pose an unacceptable risk to public safety, or an accidental oversight (something as minor as forgetting to tag a panel, which is more along the lines of an embarrassment). The CFAA, apparently, proposes to base their complaints investigation on their Code of Ethics. In many instances, this is going to be a lot like using a cannon to swat a fly. Clearly, they’re putting the cart before the horse here in the rush to address one of the most serious issues plaguing their programme’s integrity for years: the lack of technical oversight. Without a Standard of Practice (a handbook of technician do’s and don’t’s, if you will), any investigation into a complaint is going to be left with trying to determine the seriousness of the malpractice without a scale (or yardstick) against which to measure it (a lot like trying to determine how full the gas tank in your car is, without a functioning gauge). The KEY element in the process, however, is the reliance on that one word, complaint, which is reactionary (i.e. something has to happen FIRST), and doesn’t allow for proactive oversight (or an interdiction). Moreover, the drivers and systemic causes for technicians to engage in substandard practice can’t be addressed by an organization that allows the companies which employs them to have memberships (or associate memberships), and whose annual dues happen to represent a significant portion of CFAA’s recurring revenues (even before you include the sponsored advertising in their quarterly magazine). CFAA may defend their policy of accepting corporate memberships (and likely will) by suggesting that their program is strengthened through their member companies. The companies are, after-all-is-said-and-done, also required to adhere to CFAA’s Code of Ethics. But how many really do? With corporate culture largely responsible for driving technician practice (it’s also referred to as a paycheque), any investigation would have to involve a good deal more than the one individual whose tag is on the panel. This is further complicated by the fact that corporate memberships also include companies that represent building owners (including some large commercial property management firms). Why is the CFAA the only trades association in Canada that certifies individuals whose employers are also accorded the privilege of membership, and whose voluntary participation and advertising largesse is recognized in glowing terms and much fraternal good-will? Do they represent the trade, the business or the concept of fire alarms? And should a corporate membership automatically confer integrity (which is how the CFAA has been selling it). Where do you draw the line? Dare we mention that phrase conflict of interest? As you read through the complaints procedure guideline, you’ll quickly notice that formalizing a complaint against a certified technician requires the cooperative participation of both the building owner and a representative of the local fire department. In point of fact, the only individual that can actually INITIATE the complaint process is the building owner (the very same CFAA member organization that hired the CFAA member fire service company which employs the CFAA certified member technician in the first place)! For a building owner, it’s a bit like shooting oneself in the foot. 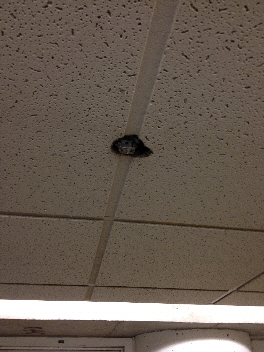 “... maximizing the effectiveness and use of fire alarm systems...”? It would appear that the CFAA has virtually guaranteed they will never have to process a complaint! They will, no doubt, decide to promote the success of their new initiative as a glowing testament to the ethics and professionalism of their members. Kudos have to go to the committee that formulated this brilliant strategy! This does, of course, raise some additional questions concerning their certification program. How can the basis for annual technician re-qualification criteria focus purely on being able to document having taken the proscribed educational and training courses? And how can any technician member be allowed to renew their certification for more than one (1) year? (There are several technicians I know of that opted for two-year renewals in the month BEFORE the new training policy was actually implemented, which meant they effectively put off having to comply with it.) Now granted, the entire program launch was poorly handled, which resulted in a lot of confusion. This was compounded by the fact that no-one could get a straight answer from the CFAA Executive because many didn’t fully understand it themselves. I actually have first-hand experience with the here-to-for-unpublished CFAA complaints process. I’d like to share more of the details from this Editorial so you can understand just how unworkable and frustrating the experience is going to be for any owner, AHJ or CFAA member (keep in mind that ONLY A BUILDING OWNER can actually initiate CFAA’s complaints process). Is the paperwork I have for the above referenced project the sum total of the Verification Appendix “C” documentation, or is there more (six pages consisting of Vancouver’s Appendix C.1, and five sheets of devices)? If there is more, please send them by reply. Thank you. Not exactly professional (or polite), and again, not what I would have expected. And while I was careful to document, what I now considered to be the gross malfeasance and fraud of a BC Chapter Director, in the formal complaint I filed, CFAA’s investigation was almost immediately compromised when he contacted the building owner directly. And with an owner now unwilling to file a complaint (or permit the use of the Appendix “C” report to advance the investigation), CFAA’s complaints panel couldn’t proceed, and ruled (correctly) that there was insufficient evidence to prove that their Director member had breached the Code of Ethics. I think it’s a given that the owner’s reluctance to cooperate in the investigation may have stemmed from the genuine concern that, even thought the system had been accepted by the local authority, they might have been required to expend additional resources to bring it into full compliance with CAN/ULC-S524-06 (Standard for Installation of Fire Alarm Systems), not to mention that they would also have to engage the services of another qualified Verifier to ensure the modifications were done correctly. But it is that initial contact with the owner BY THE RESPONDENT in the wake of my filing the complaint, that still has me deeply troubled (more-so now, because the published CFAA complaints process doesn’t specifically forbid this but actually encourages such dialogue between the parties). The only possible reason I can think of for the Respondent to contact the building owner directly, in light of this owner’s sudden reticence to cooperate, was to coach them into how to advise the CFAA appointed investigator that the Verification Appendix “C” report I had been provided, was being used in a manner in which they hadn’t authorized (I had requested a copy of the document in an effort to assist a local service provider in troubleshooting the system). But wait. It didn’t end there. The individual that was the subject of the complaint also reached out to me and attempted to intimidate me into withdrawing my complaint. Despite my advising him that this behaviour was unacceptable, and my specifically requesting that he refrain from further contact with me on the subject, the threats and intimidation continued. This ultimately resulted in my filing a second complaint with the CFAA. And in a move that continues to perplex me to this day, the CFAA Executive decided to join the two complaints together, so their final ruling (that there was no violation of their Code of Ethics) essentially quashed them both (I should mention that the only individual with the right to appeal in this process is the technician member that the complaint is filed against). It’s interesting to note that even though their ruling favoured the Respondent, the CFAA’s Executive, the local authority, the Director member AND the building owner were all aware that, not only was the system STILL non-compliant, the Verification Appendix “C” Report (a document that is supposed to remain on site for the life of the system) was bogus. Do you see what I mean with my comment: We are all living in the shadow of another Grenfell Towers? And this is where I finally get to open that proverbial can of worms. What the majority of technician members (and the industry) don’t seem to realize is that the CFAA is technically not certifying their member’s practice. Without technical oversight of an individual’s practice (which involves an actual Standard of Practice, regular practice reviews, technical support and ongoing training), the certification the CFAA provides is nothing more than a formal acknowledgment that the technician member performing the annual test of a fire alarm system meets the “knowledge of this Standard” suggested as part of the acceptance criteria for qualified persons in CAN/ULC-S536-04’s Appendix “A”. It’s really no different than the certificate that’s often provided at the end of a course of study, only the CFAA has figured out the way to rent theirs out (through compulsory annual fees) and labelling it maintaining good standing. 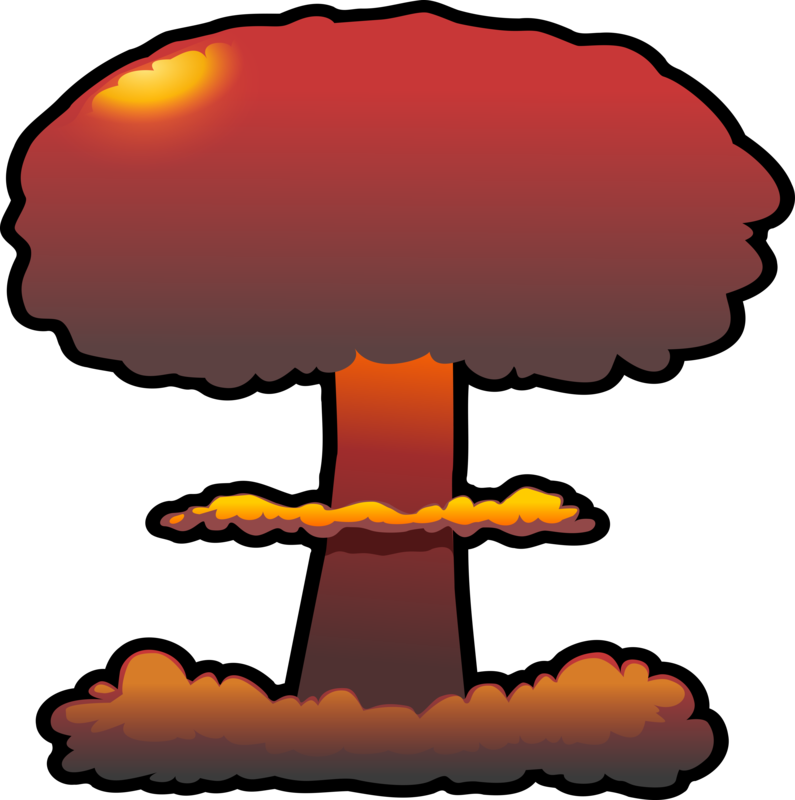 This also puts them in the enviable position of being able to DENY ANY RESPONSIBILITY for their member’s actions (although the courts may rule differently on the subject if a catastrophic loss-of-life event were to occur in a jurisdiction in which their technicians are involved). Can the individuals that the CFAA certifies for testing be engaged in installation, maintenance, or service tasks on fire alarm systems (which many provincial jurisdictions have defined as electrical work)? Should they? Are they qualified to perform a Verification? How does the CFAA identify those technician members they’ve certified to perform these services when the courses they’ve been offering for over their forty-five-year existence barely touch on some of the key aspects? I’m going to offer a small informational tidbit at this juncture that wasn’t mentioned in the article, but that could easily have been advanced by Mr. Straw in defense of this technician’s actions. ULC maintains a Certification Programme for companies engaged in the installation and monitoring of fire alarm system premises transmitters in conformance with CAN/ULC-S561-13 - Standard for Installation and Services for Fire Signal Receiving Centres and Systems. The programme provides a very limited degree of technical oversight in the form of field reviews (typically three installations from each certified provider are chosen each year for evaluation by a locally appointed ULC inspector). I happen to know that the technicians employed by CANASA member companies (many of whom actively participate in ULC’s Certification Programme) are involved in INSTALLING and TESTING this equipment. Doesn’t it follow that a technician working for a ULC Certified Installation Provider might have a considerable advantage over many of the registered fire alarm technicians that are only trained and engaged to TEST? Doesn’t installation require considerably broader knowledge and troubleshooting skills? And don’t the equipment and systems that alarm installers service invariably all employ supervised circuits of a “standard wired alarm system”? To suggest that a security alarm technician can’t troubleshoot (or replace) an identical smoke detector installed on a conventionally wired initiating circuit of a fire alarm panel is just a wee bit wrong, if you ask me. It wouldn’t be much of a stretch for many of these professionals to obtain the “knowledge of this Standard” in the previously mentioned Appendix “A”. I’m certain that they would run circles around a lot of the certified fire alarm techs out there (but again, that’s just my opinion). What does it mean to maintain good standing, or when you hear the phrase a member (or technician) in good standing? When you compare three associations: ASTTBC, CFAA, and EGBC (Engineers and Geoscientists of British Columbia), good standing has some very different requirements. ASTTBC, and EGBC both have published Practice Guidelines that include a requirement for achieving a certain number of training or educational credit hours. CFAA only introduced an actual training requirement in 2016. ASTTBC’s and EGBC’s Practice Guidelines clearly lay out the expectations and conditions under which they expect their members to practice. EGBC sponsors a number of educational and training events during the course of the year, and while ASTTBC hasn’t been actively engaged on the same level as EGBC, they have published a list of acceptable training organizations and courses. This is also where the two associations responsible for certifying technicians engaged in testing and servicing fire alarm systems radically diverge, because unlike EGBC, there is no actual support provided to the membership. Of the two (ASTTBC and CFAA), only ASTTBC has positioned themselves to actually implement a support strategy. They have a Practice Guideline and two panels of volunteer members (the Fire Protection Certification Board and the Practice Review Board) which they can draw upon to provide direction. ASTTBC hasn’t fully leveraged the available technology to fully engage their members, however, and sadly, neither has the CFAA (although the latter has at least made some recent inroads by utilizing the LinkedIn platform). It must also be pointed out that the CFAA publishes a quarterly magazine which often contains some informative articles. But should paying your dues have ever automatically entitled you to practice? Up until 2016, the only time CFAA actually mandated any sort of training (attached to technician re-qualification) was the required Technician Upgrade Course they introduced right around 2009. That requirement was meant to address the significant changes in the Standard for Fire Alarm Testing and was largely driven by the Ontario Fire Marshall’s Office which had identified a long list of problematic inspections that were being conducted by supposedly qualified individuals certified by the CFAA. What about those technicians that opt out of paying dues? Does this automatically render them any less knowledgeable than the individual that continues to pay them (do they somehow lose the knowledge and skills they’ve cultivated, perhaps over YEARS in the industry)? At the time of Mr. Michael Connaghan’s removal from ASTTBC’s RFPT Registery in 2012, he had achieved endorsements in Fire Extinguishers (EX), Special Suppression (SP) and Water-Based Fire Suppression Systems (WA). The tag provided in the above example was found on a Notifier fire alarm control. For the sake of this discussion, I’m going to ignore the obviously fraudulent addition of the Fire Alarm (AL) and Emergency Lighting (EL) endorsements on the stamp, and let’s imagine he decided NOT to counterfeit his original ASTTBC issued stamp with the EX, SP, and WA endorsements either. Is his ability to identify and perform the annual maintenance on a fire extinguisher compromised by the fact that he hasn’t paid his dues (is in good standing)? Well, in Richmond, a community which happens to have adopted a By-law that recognizes ASTTBC (where the tag pictured above was found), that answer would arguably be yes. What about in a jurisdiction like New Westminster, Maple Ridge, Port Coquitlam, Victoria, Fort St. John (that don’t have established technician qualification criteria)? 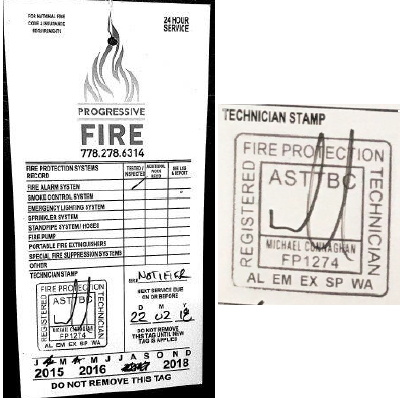 Could he have demonstrated his knowledge of the Standard (in this case NFPA 10:2007) by presenting his training certificate from BCIT to the local authority, while not having an affiliation with any professional association (could he have just signed his name on the tag without going to the trouble of counterfeiting an ASTTBC RPFT stamp)? Most emphatically YES. Mr. Connaghan’s decision to use a counterfeit ASTTBC stamp has pretty well ensured that he won’t be able to practice in this industry again (at least in British Columbia). You see, ASTTBC has very strict guidelines as to the use of their stamp. For one thing, even though YOUR NAME might be on it, the stamp actually belongs to ASTTBC and they can recall it under certain circumstances (like when you don’t pay your dues). The stamp is copyright, and the term RFPT is trademarked. To use either, you have to be a member in good standing. The City of Richmond Fire Prevention Officer that discovered the error on Mr. Connaghan’s tag (the fact that both February and April were scratched out) thought, at first, that he was simply dealing with a clerical mistake. When he discovered that the telephone number of Progressive Fire was no longer in service, and contacted ASTTBC, the situation suddenly took on a far more radical twist. My point here is simple. In most jurisdictions across Canada, the local authority should be checking to ensure the individual engaged in the testing and inspection of life safety equipment can demonstrate some form of qualification (a combination of knowledge and training). In point of fact, the building owner should be asking for the same thing. Membership in a professional association identifies the technician as having some level of training and experience, but without a practice guideline (a set of clearly established rules of conduct), professional oversight, and technical support, any reference to good standing means diddley-squat. Supervised smoke detector installation in Edmonton, Alberta. 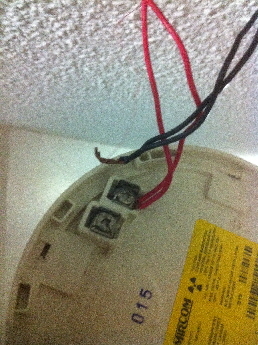 Note how the wiring is twisted together under the terminals. 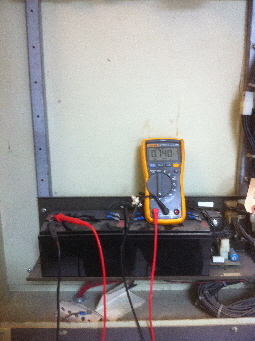 Current draw (in supervisory mode) is 740 mA on a battery pack comprising four 6 volt 12AH batteries. You do the math! So now we come to the reason that’s central to this first Editorial of 2018. It behooves any certified, or registered, fire equipment service technician to investigate what their potential involvement in a building which experiences a catastrophic loss-of-life event will actually entail. You have to initiate this discussion with both your employer and the agency responsible for your certification. Is YOUR professional association going to stand behind you? Is your employer? Your employer’s Insurer? Who is going to assist the Lawyer you’re going to have to hire with the technical support he/she will require to navigate all the applicable Codes, Standards, and Regulations, and formulate a good legal defence? Will your certification / registration survive a legal challenge? What about your own personal professional practice? Have you documented the testing you’ve performed, in accordance with the relevant Standards (and any local jurisdictional requirements)? Are you performing the required testing, in accordance with the relevant Standards (and the local jurisdictional requirements)? It is important to note that the courts will always fall back to the National Fire Code along with any additional documented procedural requirements your association has published (and expects their members to follow) and your local jurisdiction’s published requirements. The National Fire Code will not recognize any of YOUR EMPLOYER’s policies that involve short-cuts which may compromise the testing criteria in order to stay competitive or not rock the boat / open that can of worms, so their building-owner-customer stays satisfied. As a registered technician (or a qualified person), to whom are you responsible for reporting issues concerning non-functional, compromised, or improperly installed equipment? While ASTTBC provides you with a very specific suggestion to record your observations of the building’s condition when formulating your testing plan, the Red Tag procedure that identifies non-functionality only applies to the equipment you’re directly qualified to service and inspect. It says nothing about reporting what you may have observed in the building as you were engaged in performing your duties (with the one notable exception of reporting the unethical practices of another RFPT). Your employer may have developed a specific form (or format) for reporting deficiencies in the building you’re inspecting (perhaps even at the behest of their liability insurer). If they haven’t, I would urge you to add this to the list for your discussions. Whenever a fire results in a death, the provincial authority is mandated to hold a full inquest. The circumstances of the incident are reviewed along with any First Responder comments that might stem from the subsequent investigation. The inspection and test records for the building are going to be carefully scrutinized. The building owner is going to be asked to produce these along with any correspondence they may have had with the organizations they’ve entrusted to carry out the responsibilities under the Code as their authorized representative. If you happen to be the RFPT (in British Columbia) whose signature and stamp is on the service tag, then your employer (or their insurer) is going to fall back onto the provisions in ASTTBC’s Practice Guideline to determine how they can shift any responsibility to you! Don’t kid yourself! It’s going to rapidly turn into a real dog’s breakfast and if you haven’t CYA, you’re headed for a world of hurt. This goes double for those of you who are largely functioning in the certification limbo that’s still without a practice guideline (and which many provinces have chosen to recognize in the absence of something with REAL TEETH). This series examines the Fire Alarm Verification process in depth. Our Editorial EXTRA! (April 2015) - The Wolf on the Board! Fire Alarm Communicator Installation and Testing Course!